Looking for chameleon for sale online? Looking for the nicest chameleons for sale online? Tortoise Town has a full selection of chameleons for sale, including veiled chameleon for sale, panther chameleon for sale. Above all, shop their wide selection of baby panther chameleon. Panther chameleons for sale. In contrast, baby panther chameleons are becoming more and more popular. When looking for the best baby chameleon, find the best panther chameleon breeders. Because there are so many species of chameleons for sale to choose from, we recommend researching the different types before deciding which to purchase. As the 2 most popular species of pet chameleon, we recommend veiled chameleon for sale, or panther chameleon for sale near me. Also, Baby chameleon for sale online are available thru captive-bred pet chameleon breeders. Most importantly, CB Reptile is a captive bred breeder of various reptiles for sale online. Therefore we have a large selection of captive bred chameleons including, panther chameleons, veiled chameleons for sale, and another baby chameleon for sale. Also, when considering purchasing a baby panther chameleon for sale, or a baby veiled chameleon for sale, consider the end result you are looking for. Firstly, the Panther chameleon price is much higher, they are also a much friendlier species of pet chameleon for sale if you plan on handling your new pet chameleon. Secondly, a Panther not only is more colorful, in the end, we believe it makes a much better pet chameleon for sale than it’s veiled cousin. 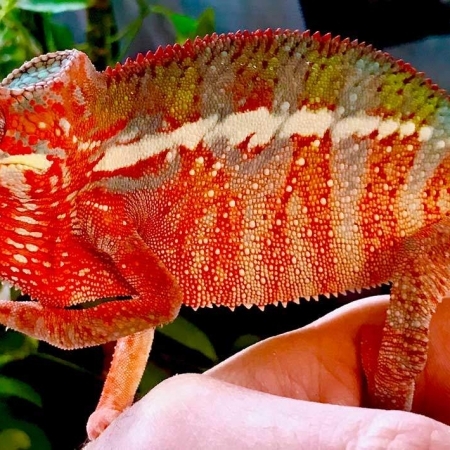 Lastly, when considering a chameleon for sale, whether it be a panther chameleon for sale, or a veiled chameleon for sale, choosing the right panther chameleon breeder or veiled chameleon breeder is key. What type of pet chameleon for sale should I buy? Great Question. The 1st question is how much do you want to spend? 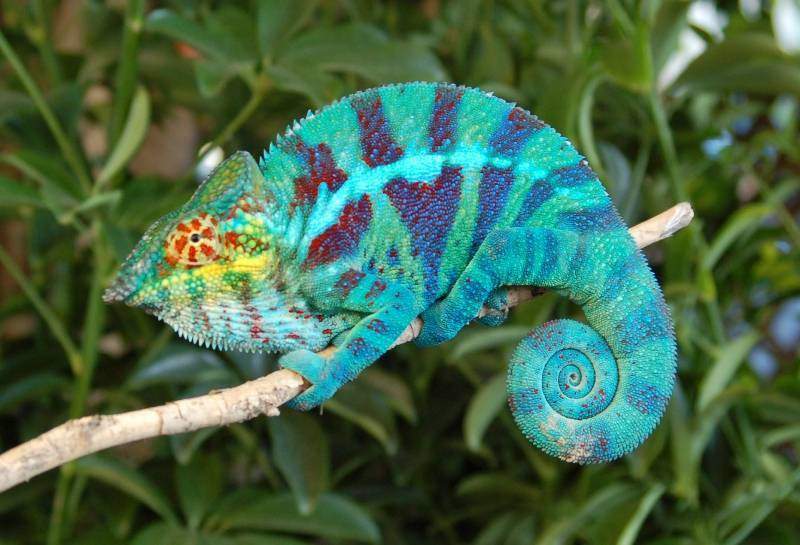 Most noteworthy, Panther Chameleons are far and away the best as far as a handleable pet, and also the most colorful. Secondly, they are also the most expensive due to the cost of them and the time involved with breeding. Most of all there is great time involved with hatching, and raising the young panther chameleon babies. Because of this they can range in price from 200-800.00 per panther chameleon baby for sale. It is well known that Panther chameleons are one of the most colorful chameleon species available today especially captive bred. While Panthers are native to Madagascar, Panther Chameleons are able to turn a wide variety of colors. Additionally, colors of the panther are dependent on their locale or the area from which their line originated. Male panther chameleons are larger and typically have a body length of 12 to 18 inches. In contrast, a female panther chameleons are slightly smaller at 10 to 14 inches. Also, a male panther chameleon will be anywhere from 120 and 200 grams, and a healthy female panther chameleon will weigh around 50 to 110 grams. Panther chameleons can have a varied lifespan depending on the care they are given. As a result of good conditions, your panther chameleon should live 5 to 7 years. Also found in Saudi Arabia, as well as Yemen in the Middle East, the veiled chameleon, also known as the Yemen chameleon, is a relatively large chameleon species. Similarly, the Veiled Chameelon for sale is well suited for the first-time chameleon owner. While its native range has some area of dry deserts, the veiled chameleon actually lives among coastal mountain slopes. Because of this, they experience significant rainfall or in slightly more arid valleys. Most noteworthy, they also are used to year-round water and moderate to heavy vegetation. More recently, the veiled chameleon has been introduced and established small populations on the island of Maui in Hawaii and in Florida. Even more popular than the panther, Veiled Chameleons are the most popular pet chameleon for sale in the USA. Because Veiled Chameleon can be found at pet stores, be careful not to purchase a wild caught cham. Veiled Chams found in pet stores are normally wild caught,older and unhealthy. Because of this we only work with captive bred chams. At Tortoise Town our Veiled Chameleons are captive bred, and are hatched and raised with care here at our chameleon breeders facility. Keeping a veiled chameleon for sale is considered novice. Similarly, Chameleons for sale, in general, are not beginner animals but those designated novices are considered the best beginner species in the hobby. Veiled chameleons are though to have large, stable captive populations relative to other species. Also, veileds are relatively easy to breed as well. Interestingly, the veiled chameleon is a very common species in the pet trade with widely spread captive populations. Native to the south Arabian peninsula (Yemen and Saudi Arabia) it is sometimes referred to as the Yemen Chameleon. A common myth is that this species does not need much water or humidity as it is from a desert region, but this is not true; this species inhabits the greenest area of the peninsula where the climate is subtropical to tropical. There are several feral colonies of this species in areas of Florida and California. In conclusion, the veiled chameleons are a large species of chameleon with an average adult size/length of 18”-24” (45-70cm). Because they are well known for their prominent casque (crest on top of the head), which is believed by some to help channel rainwater toward their mouth for drinking. Lastly, this chameleon species is predominantly green, ranging from a bright yellow-green to a drab olive. Males have a much larger casque and a distinct pattern of brown and yellow barring. Females and juveniles are primarily solid green with some yellow spots and stripes. Like most chameleon species veiled chameleons are tree-dwelling reptiles that are active only during the day. They can generally be found hunting prey or basking on the branches of trees and large bushes. Veiled chameleons are very territorial and don’t tolerate the presence of other chameleons in close proximity. When threatened they will frequently change color and inflate their body to appear larger. In contrast, some also display the unique ability to vibrate or buzz when frightened. Because when they do this, it’s an attempt to intimidate other chameleons, predators, or even an insect bothering them. Contrary to popular belief, chameleons don’t change color in a direct attempt to match their background. Because these color changes are influenced most by their state of health. In contrast, these color changes show emotions or level of stress and the process of thermoregulation. Consequently, veiled chameleons are better for observation and should not be handled regularly as often as panthers per say. Some veileds tolerate occasional handling and even hand-feeding, while many don’t and can be quite aggressive towards people. With proper husbandry, veiled chameleons can live 5-7 years on average.